The Facebook group page is overflowing with shocked messages from present customers, loyal consultants and business builders. Twenty eight years is a long time for a company and I think every person who joined the company to start their own part time business had no idea that this day would come. All the consultants are in shock and grieving. Obviously if you walked into your work this morning and you found this sign on the door what would you do? Would you not rally with your friends and come up with a Plan B? In the Lia Sophia Facebook group today it has gone from supportive to women being very angry because other Direct Selling consultants are trying to encourage them to move to “their” company. How do you feel about these comments? 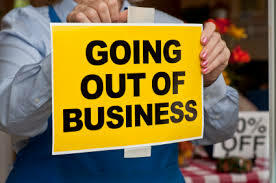 If you were in a business and you were told it was shut down just before Christmas, what would your first thought be?? Would you not ask yourself how you were going to make extra money in the New Year? Would you not want to at least check out what the alternatives were out there. It appears a lot of people saw the writing on the wall and were already looking for another company to join, but for the others, they are very ANGRY. Read the book by Paul Zane Pilzer – The New Millionaire. In this book he predicts what direct selling companies will provide an income of over 1 million dollars in the next 10 years. Once you find the company it is important to find good leaders and team builders. Google the individual. See how long they have been in business, and what business skills they can teach you and how supportive they will be. Google the company events, and awards given to individuals. Find someone who resonates with you. Who shares the same beliefs, goals and challenges. My heart goes out to every Lia Sophia consultant. This was hard news to swallow. Take time and then take my advice. You have an amazing talent and built amazing teams. You were rewarded highly and respected by the company and all your customers. Do not waste that talent, there are great things ahead for you as you move forward to another company. Take the time to do your research. People like myself would love to talk to you and see if we can help. That is what women do in this industry and that is why over 82% of women succeed in Direct sales and Network Marketing. Let me help you make over $100,000 a year.